On May 17, 2016, the Equal Employment Opportunity Commission (EEOC or Commission) issued a final rule to amend the regulations implementing Title II of the Genetic Information Nondiscrimination Act of 2008 (GINA) relating to employer sponsored wellness programs. The final rule addresses, among other things, the degree to which an employer or a covered entity may offer inducements to employees’ spouses or other family members to respond to questions about their manifestation of disease or disorder, current medical conditions, or past medical conditions on health risk assessments assessment (HRA) administered in connection with an employer-sponsored wellness program. It provides that employers may provide limited financial and other inducements or incentives in exchange for an employee’s spouse providing information about his or her current or past health status as part of a wellness program, and reaffirms that requesting genetic information from employees and employees’ children is prohibited. The final rule was effective on July 18, 2016, and applies prospectively. Wellness program compliance will be required on the first day of the first wellness plan year that begins on or after January 1, 2017. If the health plan that is used to calculate the permissible inducement limit begins on January 1, 2017, January 1, 2017 is the date that the wellness program begins. If the health plan used to calculate the maximum level of inducements begins on April 1, 2017, April 1, 2017 is the date that the wellness program begins. January 1, 2017 and April 1, 2017 respectively are the dates the new rules controlling inducements apply to the employer-sponsored wellness program. GINA is a federal law that forbids discrimination on the basis of genetic information in health insurance and any aspect of employment. It has two parts – Title I and Title II. Title I prohibits discrimination based on genetic information by health insurers and group health plans. Title II prohibits discrimination based on genetic information in employment. This post addresses Title II of GINA, which the EEOC enforces. The final rule discussed in this post relates specifically to the requirements (outlined below) of Title II of GINA as they apply to employer-sponsored wellness programs. As stated above, Title II prohibits discrimination in employment based on genetic information. It protects job applicants, current and former employees, labor union members, and apprentices, and trainees from employment discrimination based on their genetic information. GINA strictly prohibits the use of genetic information in making employment decisions. No exceptions. As it relates to acquisition and disclosure of genetic information, GINA does not prohibit it; GINA merely restricts acquisition, and disclosure of such information. For example, it is generally permissible for an employer to collect genetic information as part of a wellness program if the information is given voluntarily and complies with rules related to confidentiality, inducement, and the class of individuals from which it is permissible to collect information (i.e. an employee’s spouse). The final rule applies to ALL wellness programs. It applies whether the program is part of a group health plan, and it applies if it is not part of a group health plan. It applies even if the employer does not offer a group health plan. The rules related to inducement only apply the collection of genetic information. GINA does not apply to inducements related to engaging in activities that do not require obtaining genetic information, such as participating in a weight loss, exercise or nutrition programs. As stated in the proposed rule, similar to any health or genetic service, if an employer offers a wellness program that collects genetic information, it must be “reasonably designed to promote health or prevent disease.” The wellness program must have a reasonable chance of improving the health of the participant or preventing disease in the participant. The program cannot be overly burdensome to employees, a subterfuge for violating Title II of GINA or other employment discrimination laws; nor can the program be “highly suspect” in the method chosen to promote health or prevent disease. Imposes unreasonably intrusive procedures, an overly burdensome amount of time for participation, or significant costs related to medical exams on employees. It consists of a measurement, test, screening, or collection of health-related information and that information is not used either to provide results, follow-up information, or advice to individual participants or to design a program that addresses at least some conditions identified (e.g., a program to help employees manage their diabetes if aggregate information from HRAs shows that a significant number of employees in an employer’s workforce have diabetes). Genetic information of an employee’s spouse and children are considered genetic information about the employee. The final rule addresses various classes of individuals as it related to inducements for providing genetic information: employee, employee’s spouse, and employee’s children. This final rule clarifies that while a wellness program cannot offer an inducement to an employee or an employee’s children, for acquisition of genetic information, the wellness program may offer a limited inducement to acquire such information from the employee’s spouse. As in the proposed rule, the final rule provides that a wellness program cannot offer an inducement to an employee for acquisition of genetic information. Under GINA, it is also prohibited for an employer to request, require, or purchase the genetic information of a potential or current employee. There are however, a few limited exceptions to when an employer can legally have access to an employee’s genetic information; The employer must keep genetic information to which the employer has access confidential and in a separate medical file. Remember the purpose of Title II of GINA is to prohibit discrimination in employment based on genetic information. It is unlikely that the employee may be discriminated against an employee based on genetic information of a spouse. There is little to no chance that the employer can ascertain information about an employee’s genetics or predisposition to disease from health information about the employee’s spouse. It follows that collecting information from spouses of employees is permitted, as it is not likely to frustrate the purpose of GINA- protect the employee from discrimination. The final rule nevertheless limits financial and other inducements or incentives for an employee’s spouse to participate in wellness programs that ask for current or past health information regardless whether the wellness program is connected to a group health plan and limits financial and other inducements or incentives even if no wellness program exist. An employer may, in certain circumstances, offer an employee limited inducements for the employee’s spouse to provide information about the spouse’s manifestation of disease or disorder as part of a HRA administered in connection with an employer-sponsored wellness program, provided that GINA’s confidentiality and inducement limits requirements, discussed below, are observed, and any information obtained is not used to discriminate against an employee. In the case where the employer has access the employee’s children’s genetic information there is greater chance, then with spouses, for such information to be used to discriminated against the employee, because it may be possible to determine information about an employee from genetic information about the employee’s children. The final rule restates that an employer may open up a wellness program to the employee’s children provided that the employer does not offer inducements in exchange for information about the children’s health status or about their genetic information. The final rule also makes it clear that the prohibition on offering inducements in exchange for such information (health status or genetics) of children applies to both adult and minor children. If a wellness program is open only to employees and family members in a particular group health plan, then the maximum inducement for the employee’s spouse to provide information about current or past health status is 30 percent of the total cost of self-only coverage under the group health plan in which the employee and family members are enrolled. Example: if an employee is enrolled in a self and family plan for a total premium of $14,000 (employee plus employer contribution), and the health plan has a self-only option for a total cost of $6,000, the maximum inducement for the employee’s spouse to provide health information is 30% of $6,000, which equals $1,800. If an employer provides more than one group health plan and the enrollment in a particular plan is not required to participate in the wellness program, the maximum inducement is 30 percent of the lowest cost major medical self-only plan the employer offers. Example: if an employer has three self-only major medical plans that range in total cost from $5,000 to $8,000, the maximum inducement that can be provided for the employee’s spouse to provide health information is 30% of $5,000, which equals $1,500. 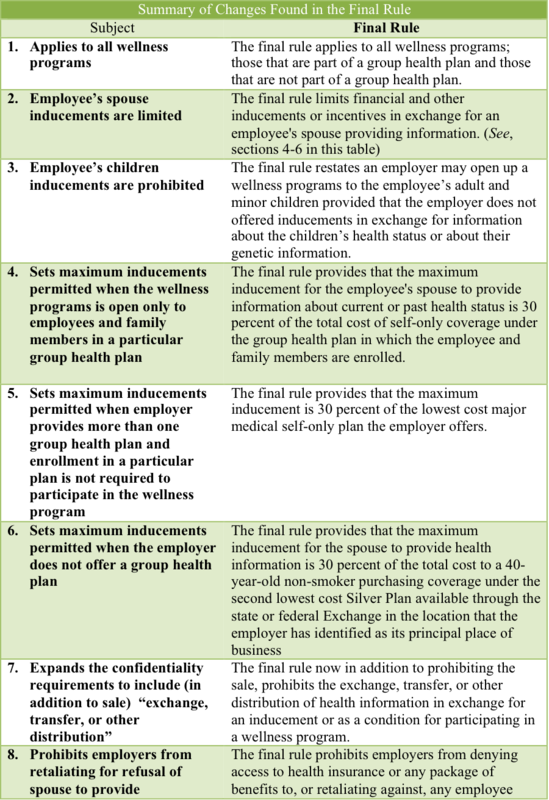 If the employer does not offer a group health plan, then the maximum inducement for the spouse to provide health information is 30 percent of the total cost to a 40-year-old non-smoker purchasing coverage under the second lowest cost Silver Plan available through the state or federal Exchange in the location that the employer has identified as its principal place of business. Example: if a 40-year-old non-smoker could purchase the second lowest cost Silver Plan on the State Exchange for $4,000, the maximum inducement the employer could offer for the employee’s spouse to provide health information is 30% of $4,000, which is $1,200. The proposed rule prohibited an employer from requiring an employee or spouse to agree to the sale of health information in exchange for an inducement or as a condition for participating in a wellness program. The final rule expands this section to prohibit not only the “sale;” it now prohibits the exchange, transfer, or other distribution of health information in exchange for an inducement or as a condition for participating in a wellness program. The final preamble also references some best practices for ensuring confidentiality such as, establishing clear policies, training staff who handle confidential information, encryption of electronic data, and timely reporting of data breaches. The requirement that genetic information obtained as part of a wellness program not be disclosed to employers, except in aggregate terms has not been changed by the final rule, and that limitation on disclosure continues to apply. Keep in mind that there are other federal and state laws that protect the confidentiality of medical information obtained through a wellness program. For example, if a wellness program is part of a group health plan, HIPAA’s privacy, security, and breach notification apply. Also state privacy and security laws, and medical record laws may also apply. The final rule prohibits employers from denying access to health insurance or any package of benefits to, or retaliating against, any employee whose spouse refuses to provide information about his or her current or past health status to an employer wellness program. The final rule clarifies that an employer is may request information about the current or past health status of an employee’s spouse who is completing a HRA on a voluntary basis, provided the employer follows GINA rules about requesting genetic information when offering health or genetic services, including but not limited to requirements that the spouse (as the employee must do) provides prior, knowing, written, and voluntary authorization for the employer to collect genetic information. The final rule makes several technical changes proposed in the Notice of Proposed Rulemaking (NPRM), such as, renumbering paragraphs resulting from the addition of new material, correcting an erroneous cross reference in the original regulations, eliminating the word “financial” to describe incentives to account for in-kind incentives, and adding necessary references to HIPAA and the Affordable Care Act. Wellness Program generally refers to health promotion and disease prevention programs and other activities offered to employees (and sometimes employees’ family members, especially those who are enrolled in the employer’s group health plans). Wellness Programs may be part of an employer-sponsored group health plan, or they may not be tied to a group health plans. “Genetic Information” includes information about an individual’s genetic tests; information about the genetic tests of a family member; information about the manifestation of a disease or disorder in family members of an individual (i.e., family medical history); requests for and receipt of genetic services by an individual or a family member; and genetic information about a fetus carried by an individual or family member or of an embryo legally held by the individual or family member using assisted reproductive technology. Family members of an individual include someone who is a dependent of an individual through marriage, birth, adoption, or placement for adoption and any other individual who is a first-, second-, third-, or fourth-degree relative of the individual. Genetic information may be acquired through commercially and publicly available documents like newspapers, as long as the employer is not searching those sources with the intent of finding genetic information or accessing sources from which they are likely to acquire genetic information (such as websites and on-line discussion groups that focus on issues such as genetic testing of individuals and genetic discrimination). All of the inducement limits are exactly the same as the limits on incentives available to employees under the Americans with Disabilities Act (ADA), as described in the final rule on the ADA and Wellness Programs published at the same time as the GINA final rule. The Silver Plan is the most frequently purchased plan on the Exchanges. (6) To a Federal, State, or local public health agency only with regard to information about the manifestation of a disease or disorder that concerns a contagious disease that presents an imminent hazard of death or life-threatening illness, provided that the individual whose family member is the subject of the disclosure is notified of such disclosure.